The default behavior is if a person opens table maintenance generator and tries to maintain the table, the table is locked and no one else can maintain the same table at the same time. 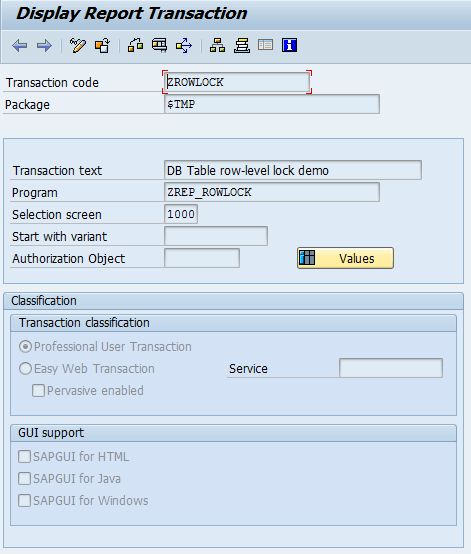 This is because there is a “table-level lock” by default in SAP. This means only one user can maintain any table at a time through SM30 or any transaction that calls table maintenance generator. 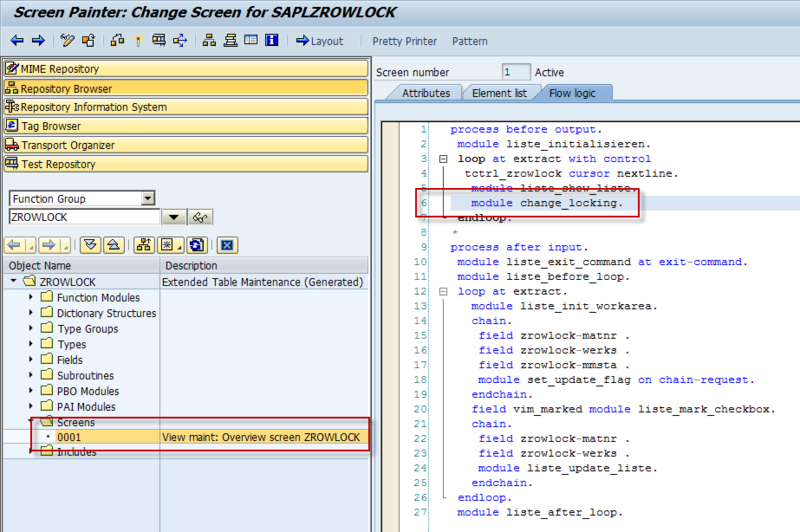 In the tutorial below you will find out how to replace table level lock with row level lock. By row-level lock you ensure any number of users can modify the table at same time, but any particular row can be modified by only one user at a time (the first one who accessed the row for maintenance). We will create a transaction for this purpose. This transaction will call our custom report where at first the table lock is deleted and subsequently the table maintenance generator will be called..
Transaction ZRLOCK will call report ZREP_ROWLOCK where we delete table-level lock on ZROWLOCK and then it calls the table maintenance where only selected rows will be locked. This will ensure that multiple users can access the table at the same time. But rows locked by one user can not be edited by anyone else until this user leaves the table maintenance and releases the row locks. 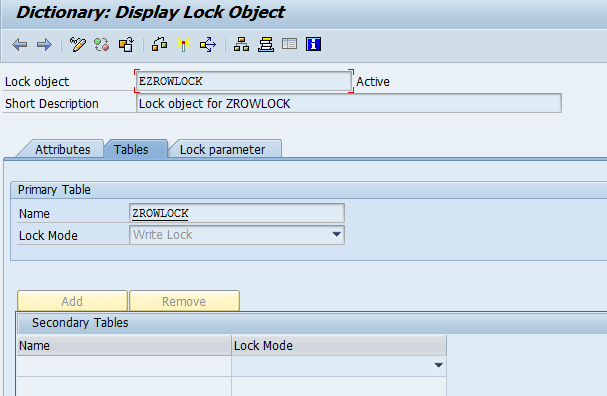 Go to SE11 and create new table ZROWLOCK with at least the following fields: MANDT, MATNR, WERKS and activate the table. Call table maintenance generator for the table. 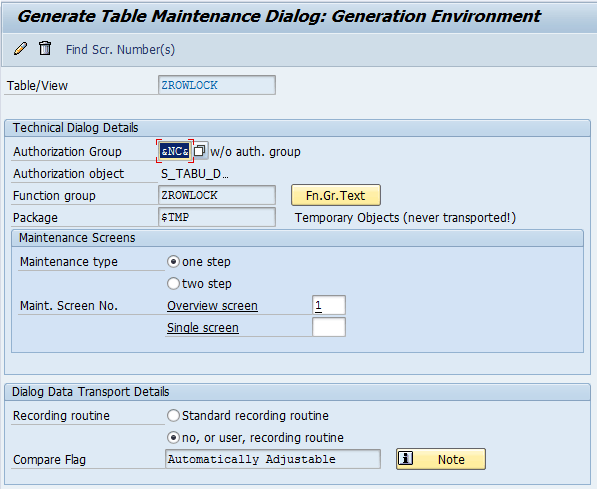 In the top menu go to Utilities – Table Maintenance Generator and create new function group for this table. Generate code for one step/single screen. Go to SE38 and create new report called ZREP_ROWLOCK. 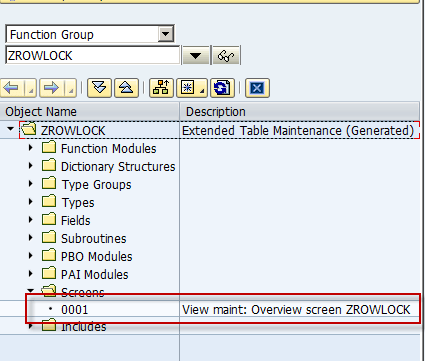 This code will delete the table-level lock on ZROWLOCK table and call its table maintenance. DATA: BEGIN OF selekttab OCCURS 1. BEGIN OF excl_cua_funct OCCURS 1. *Now call the table maintenace generator. 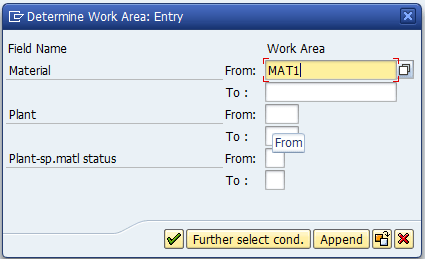 We have to modify the maintenance screen and its code so it locks only rows the user selected to be edited. Run TCode SE80 and open function group ZROWLOCK and open the one step/single screen you created using table maintenance generator. Now we add line with new module. * row is locked..hence gray..
Now we are ready for testing. 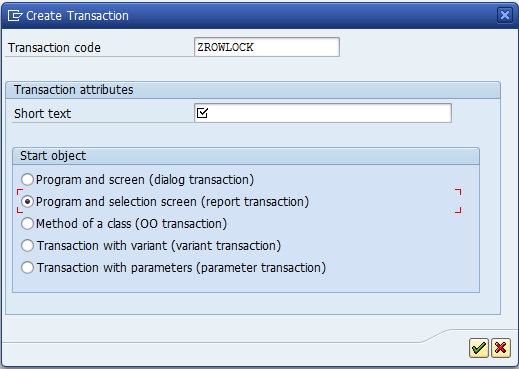 Call the transaction ZROWLOCK create some entries with random values in table. Since we have not maintained any check tables etc, the entered values may be invalid, but in a real scenario maintaining check tables should definitely be considered to be implemented. Save the changes and leave the transaction. Now open a new session and in both sessions run TCode ZROWLOCK. In this we will try to open some existing values for table maintenance. Note all selected entries are opened in change mode. In this session pass a range of materials including the one opened in Session 1. On the following you can see the row opened previously in Session 1 in edit mode is now disabled for editing. But the remaining rows are all enabled and locked for the current user/session. 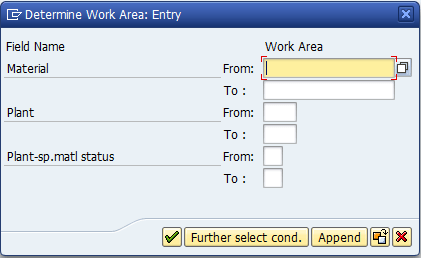 This entry was posted in ABAP, Development and tagged ABAP, database, lock, SAP, table by Spider. Bookmark the permalink. Thank you for this! 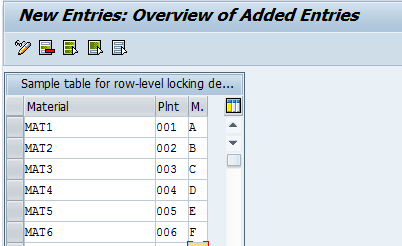 I have implemented this solution and have one big problem still – the row locking works, but: when user #1 has a row locked, and user #2 (for example myself in another session) attempts to “ADD NEW ENTRIES” to the table, it will NOT allow the table to go into edit mode nor allow any new entries to be added by user #2 until the user #1 is completely out of the table. I need to be able to have users editing and/or adding new entries at the same time. Can you help? Thank you very much! Hi Thomas, If you just want to allow all people to add new entries, you can try to add in the module CHANGE_LOCKING called by PBO of screen 0100 a condition – all fields used in the ENQUEUE function module are not initial (otherwise I guess this would lock the empty rows for other users). Is it possible when modifying a line, the screen will be one step not two step? I don’t want the pop up window during edit. Thanks! Maybe I don’t fully understand your question – the maintenance screen is just one step in this example – you can see this on screenshot from SE80 where only the screen 0001 is available. But if you are asking how to avoid the popup for selecting data to be displayed, then you’ll have to modify the contents of ‘selekttab’ and ‘excl_cua_funct’ which are passed to FM call ‘VIEW_MAINTENANCE_CALL’ so it contains only data you’d like to see/modify. when will entries be unlocked ?